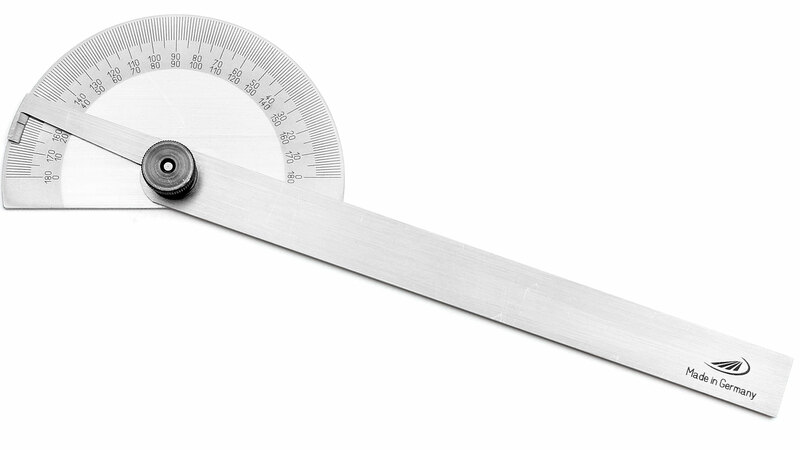 Steel Protractors are highly useful and accurate tools for setting bevels, transferring angles, and many other applications. 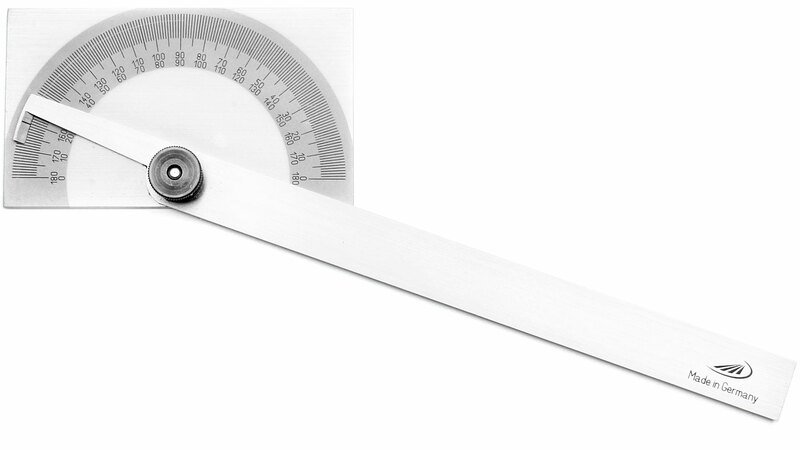 A protractor consists of a body (or base) with graduations from 0 - 180º and a blade that can be locked firmly at any angle by the lock nut. 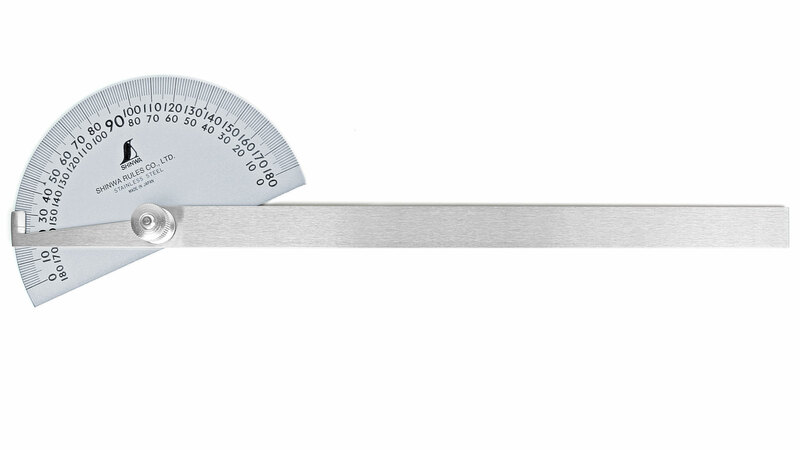 SHINWA Protractor with halfround base Measuring range 0 - 180°, with locking screw, steel body/base chrome plated essentially glare-free, blade stainless steel, graduation deeply edged. 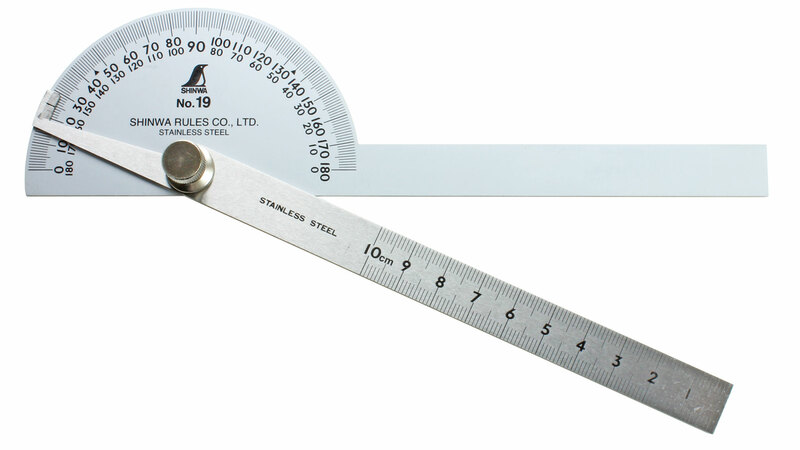 Large SHINWA Protractor with halfround base Measuring range 0 - 180°, with locking screw, steel body/base chrome plated essentially glare-free, blade stainless steel, graduation deeply edged. SHINWA Protractor with halfround base and two blades Two blades extend measuring possibilities, see picture left below. 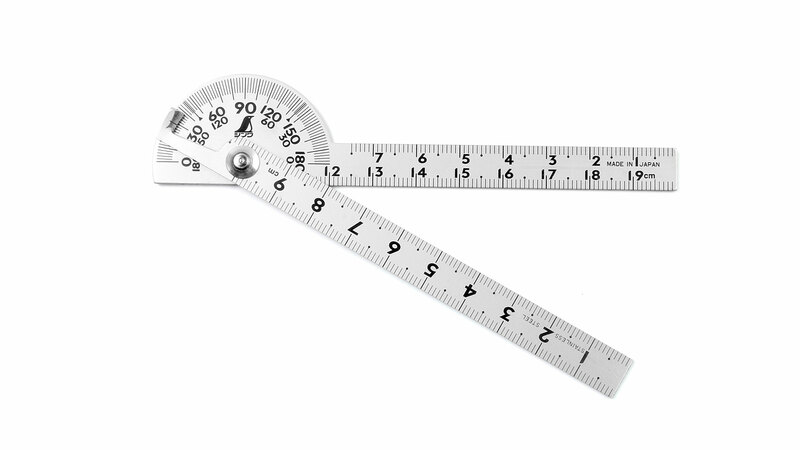 Measuring range 0 - 180°, with locking screw, steel body/base chrome plated essentially glare-free, blades stainless steel, graduation deeply edged. 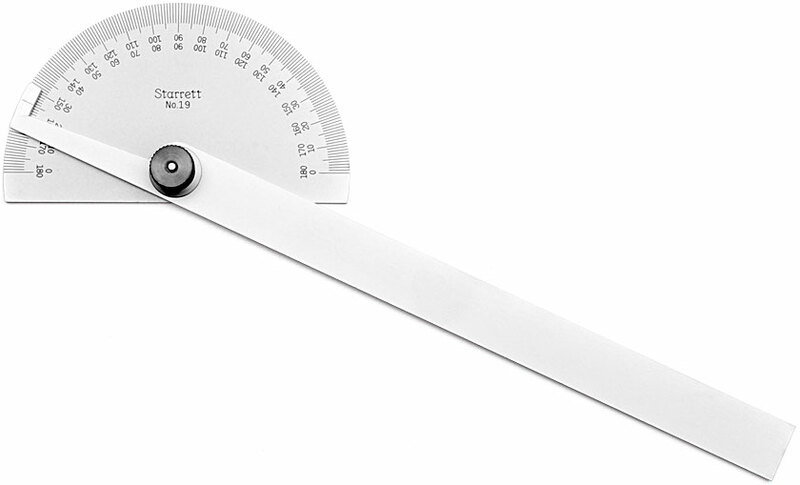 SHINWA Mini-Protractor with halfround base and two blades This pocket sized protractor has a measuring area 0 - 180°, with locking screw, steel body/base and blades chrome plated essentially glare-free, graduation deeply edged. 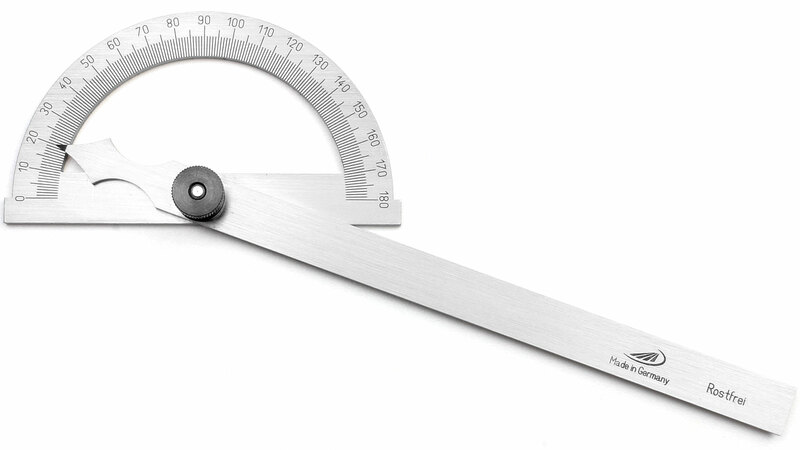 PREISSER Protractor with halfround base Measuring range 0 - 180°, with locking screw, special steel chrome plated, precision laser made graduation, delivered in paper box. (No identification number). 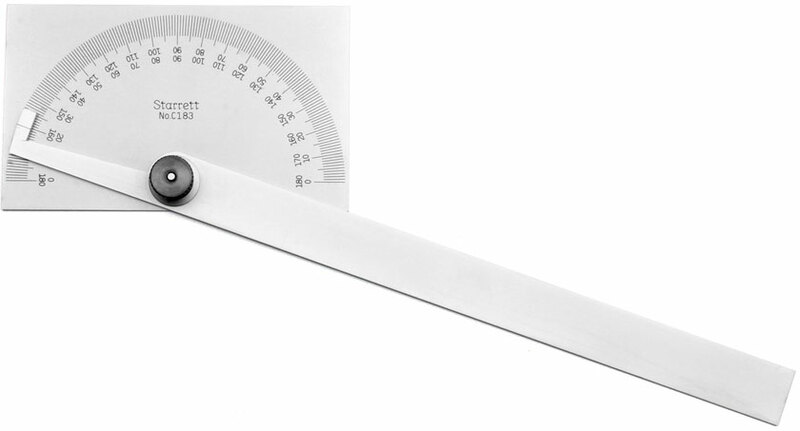 PREISSER Protractor with rectangular base Measuring range 0 - 180°, with locking screw, special steel chrome plated, precision laser made graduation, delivered in paper box. (No identification number). 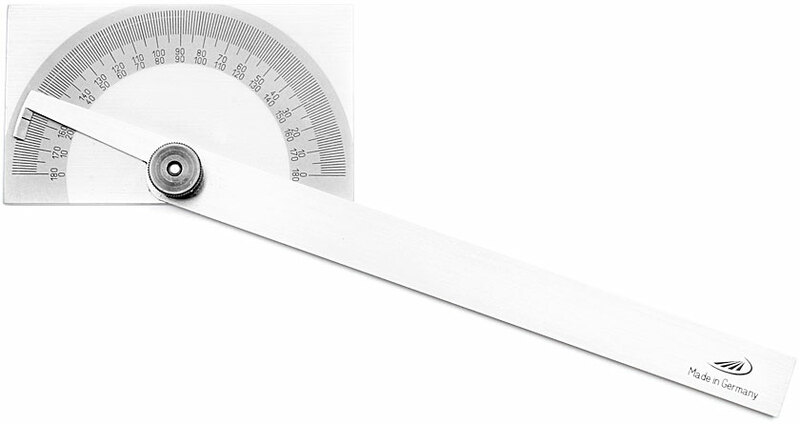 PREISSER Protractor Measuring range 0 - 180°, with locking screw, stainless steel, precision laser made graduation, delivered in paper box. (No identification number). 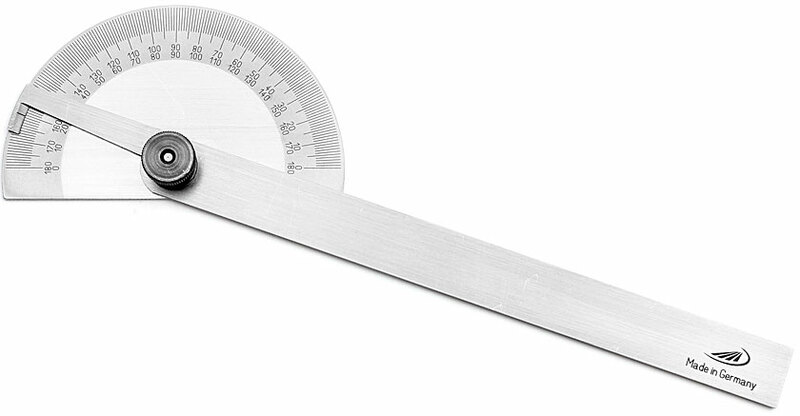 An alternative to steel protractors is the Veritas bevel setter. 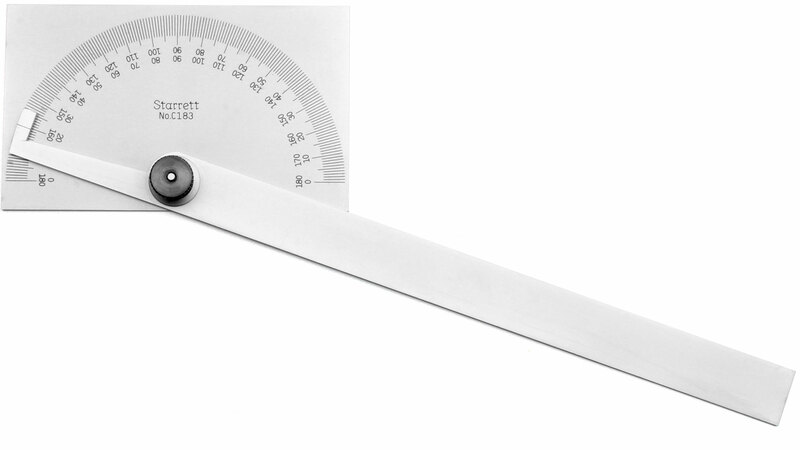 STARRETT Steel Protractor with halfround head This is a highly useful and accurate tool for setting bevels, transferring angles, small squaring tasks, and many other applications. Double graduations from 0 - 180° in opposite directions permitting the direct reading of angles and supplementary angles. Diameter of halfround head 83 mm, Length of blade 200 mm, satin chrome finish. Starrett-no: C19. 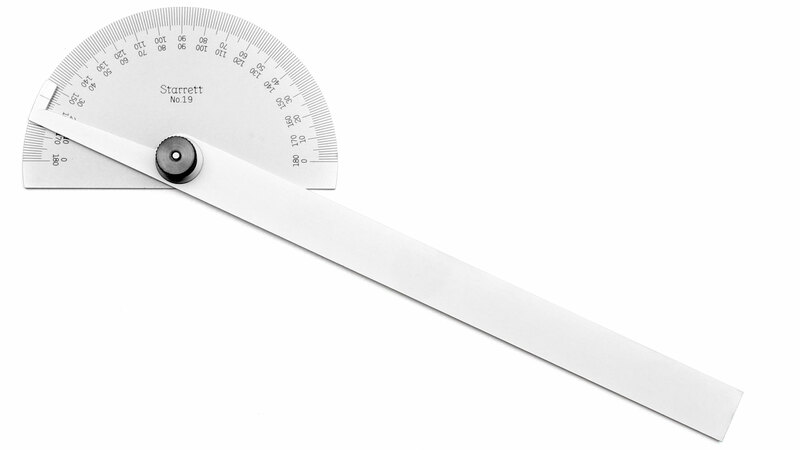 STARRETT Steel Protractor with rectangular head This protractor is exactly the same as the above, except that it has a rectangular head, thus providing four convenient working edges. Size of the rectangular head 86 x 52 mm, Length of blade 200 mm, satin chrome finish. 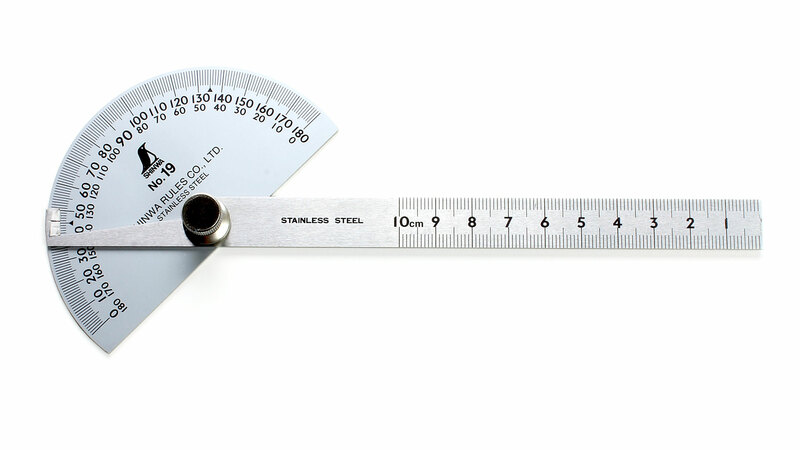 SHINWA Large Protractor with halfround base and two blades Measuring range 0 - 180°, with locking screw, steel body/base chrome plated essentially glare-free, blades stainless steel, graduation deeply edged. Two blades extend measuring possibilities, see picture right.